Where better to enjoy fresh fish than at the tranquil Isle of Skye. One relaxing Isle of Skye fish restaurant enjoyed by the aboutaberdeen.com team and highly recommended is the Creelers Fish restaurant and Gumbo Shack in Broadford. This Creelers review is based on our evening meals though we hope to return for lunch one day where a tapas style menu is available. Creelers Isle of Skye fish restaurant can be found behind the Skye Serpentarium Reptile World and can be seen on the left from the main road through Broadford towards Portree. There is a car park right beside Creelers and plenty of street parking. Access is on one level with plenty of room for wheelchair users making this an ideal eating experience for disabled people. Creelers fish restaurant is an intimate dining experience with about 10 tables in the dining area so booking is recommended to avoid disappointment. 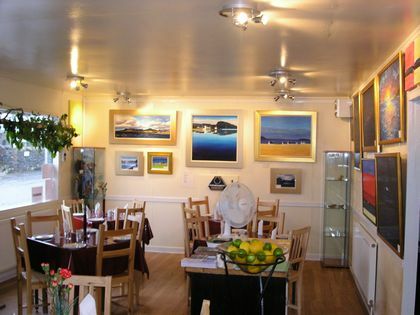 This Isle of Skye fish restaurant is tastefully decorated with local artwork which not only includes paintings but also pottery. All art work is by local artists and available to buy at reasonable prices. Tables are well laid out and the chairs comfortable. Toilets are located discretely in the corner room. Some toe tapping Jazz music played quietly in the background. One of the lovely experiences of eating at Creelers fish restaurant is that you can see the kitchen from most tables. The chef was a happy chap who greeted the aboutaberdeen team on the way in and saluted us with his chef's hat on the way out with a beaming smile. It was great to see him chatting away with the waiter and waitresses as one happy team rather than barking commands like some temperamental chefs. We've never encountered such a peaceful kitchen before. We were treated to some free little snacks in between courses during our dinner compliments of the chef. This included a delicious basil and tomato mousse which cleansed the palate as well as being a tasty treat. There is a full wine list available at Creelers and www.aboutaberdeen.com enjoyed a pint or two of the local ale, Red Cuillin. The food at Creelers fish restaurant on the Isle of Skye is said to be a mixture of Scottish, French, Mediterranean and Caribbean. There were a few dishes we were not familiar with and these were explained enthusiastically by the waiter in a really down to earth way. Some restaurants with such a high reputation, like Creelers enjoys, may develop airs but not so here. Our dining experience was very relaxed and informal with no rush and gave us a chance to savour every mouthful. Dishes were described almost lovingly by the owner who still works front of house with his team. Prices ranged from �3-60 to �9 for starters and from �8 to �18 for main meals with desserts being �5. The menu at Creelers is helpfully accompanied by well taken photographs that show off the food and really entice the diner. Fresh local produce is used at Creelers and though fish is their speciality they also have an assortment of other food available including a wide range of vegetarian dishes. Such vegetarian options include a variety of soup or garlic bread for starters and salads and pasta dishes such as penn pasta with a vegetable and pasta sauce. The staff at Creelers restaurant are happy to review their dishes with customers and discuss options such as healthy eating, food allergies, etc. The menu at Creelers fish restaurant changes daily with chefs specials as well as there being firm favourites that remain on the menus throughout the year. Starters vary from smoked venison with salad, soups and chicken gumbo. We enjoyed a delicious fish soup using locally caught fish. Unlike a typical Scottish fish soup such as Cullen Skink it was less smoky and not made with cream but with stock and the different flavours of fish were distinguishable. It was not heavy on the stomach but light enough to wet our appetite for the main course. The bread rolls were baked that day and served warm adding to the mouth watering aroma in the restaurant. 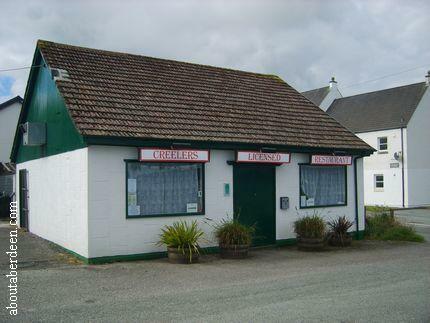 Creelers fish restaurant is famous for its Creelers Seafood Gumbo and other delicious fish dishes include sea bass, monkfish, haddock, sea bream, scallops, mussels and salmon served traditionally or spiced up like the Cajun haddock which is pan fried in a special mixture of Cajun spices and breadcrumbs. We enjoyed a generous portion of Isle of Skye king scallops which were pan saut�ed with a dry vermouth cr�me and served with a crisp salad. 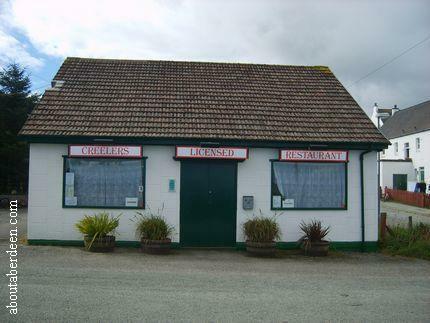 Children are made welcome at this Isle of Skye fish restaurant and main meal prices are set at �4-50. Kids can choose from a smaller portion from any dish on the adult menu or have their own menu with dishes ranging from lentil or lamb stew, penne pasta or curry. Do leave room for the mouth watering puddings which also have their photos on the Creelers menu. Aboutaberdeen also run the Scottishrecipes.co.uk website and have enjoyed a sweet or two during our research. Never before have we tasted such a delicious Clootie Dumpling pudding which was served at just the right temperature and moist enough not to leave a sticky mess on the spoon or the top of one's mouth. Another tasty pudding that we could not resist was a rich sticky toffee pudding that rounded off such a grand meal with a pleasant sugar rush. Other puddings available at Creelers fish restaurant include cr�me brulee, apple pie and their own speciality of chocolate mousse served with hot orange sauce. All sweets are priced at �5. In 2009 Creelers of Skye was named as Skye's No. 2 restaurant by Trip Advisor. Number one position was awarded to Lady Claire Macdonald 5 star Kinloch Lodge. The French Lamb Stew recipe below is one of the delicious dishes available at Creelers on the Isle of Skye. Aboutaberdeen would like to thank chef de cuisine and owner David Wilson for kind permission to reproduce his French lamb stew recipe below. The French lamb stew is also called Daube D�agneau and the recipe below will serve between 15 to 20 people. It is common for French cuisine to slowly cook on the hob for up to ten hours to draw out the flavours of the meat. Traditional French cuisine dishes cooked this way include a range of slow cooked stews named daube, pot au feu, etc. This does not mean that such recipes are time intensive though. Often, such as the case with the French lamb stew recipe, they can be simple dishes that once prepared can look after themselves on a low heat with an occasional stir. This long cooking time reduces the liquid from the dish to produce a tasty, rich, deep and thick consistency in a natural way and is well worth the wait. Few restaurants and chefs prepare dishes this way but fortunately the chefs at Creelers Isle of Skye take the time to cook traditionally using their culinary art to bring joy to their customers palates. Place the butter and olive oil into a pot and melt over a low heat until the butter is completely melted. Add the salt, thyme, rosemary, sage, paprika, capers and garlic puree and stir through. Turn up the heat to maximum and then add the diced lamb. Turn the lamb so that it all gets fully seared. Add the vegetables and sweat for 20 minutes. Add the tomato puree and stir in well. Add the wine and lentils and stir in well. Simmer on a low heat for between 4 to 6 hours so that the wine becomes reduced by 90%. Simmer for 30 minutes to 1 hour until thickened. Add golden granulated sugar to taste (Chef David Wilson suggest between 4 to 6 cups. About Aberdeen thanks chef de cuisine and owner of Creelers David Wilson for kind permission to reproduce his Wild Chanterelles on a bed of fresh herb with chorizo picante and a white truffle oil dressing recipe below. David describes this chanterelle mushrooms recipe as one of the easiest and quickest starters that can be made as well as being one of the tastiest dishes on the Isle of Skye. Green salad comprising of mizuna or rocket, red chard leaf, chives and fresh basil. To prepare this chanterelle mushrooms recipe you will need a 6 inch base sautee pan and one slotted spoon. Arrange a tight pyramid of salad in the centre of a small plate. Drizzle the salad with white truffle oil. Prop slices of chorizo picante around the outside of the plate. Melt the butter and olive oil in the sautee pan. When the butter is all melted and frothing add the chanterelles. Toss at a high temperature for no more than 20 seconds. Use the slotted spoon to transfer the chanterelles from the pan to the top of the salad. Serve chanterelle mushrooms dish as quickly as possible.